Greek PM Alexis Tsipras had a hard time defending his country’s aim for a fair debt deal in front of an EU Parliament session in Strasbourg, opting to remind MEPs that even the strongest European economy was once on its knees seeking solidarity. Facing an onslaught of criticism from several chamber members over his inability to produce “concrete” proposals for the country’s creditors, as well as over his failure to implement “necessary” reforms at home, the Prime Minister spoke instead of solidarity. As negotiations about Greece’s future continue, Athens has officially asked for a three-year loan facility from the European Stability Mechanism (ESM) and agreed to quick reforms, promising to present a new plan on July 9 at the latest. “But we want a sustainable program. We want to be in the position to repay the loans we have accepted. And when we ask to reduce the debt, we ask for that because we want to repay this back. We don’t want to be forced again and again to accept new loans to pay back the old ones,” Tsipras said in Strasbourg. Tsipras admitted that his government did not introduced as reforms deep, as its creditors would love to see, but that he says was partially because they spend most of their time on keeping the economy afloat and negotiating with the Troika. On June 30 Greece asked for a 2-year bailout program just hours before the country missed a deadline to repay €1.6 billion to the IM. That request also included a debt restructuring plan, which the Eurogroup rejected. Last week, Tsipras said that the only way to make Greek debt sustainable is to cut it by 30 percent and introduce a 20-year grace period. Now, Tsipras admits that Greece is on the verge of bankruptcy and needs debt relief to survive, and is seeking solidarity from EU. “The strongest moment of solidarity in Modern European history was in 1953 when your country [Germany] came out of two World Wars and Europe showed at the London Conference in 1953 the greatest possible solidarity,”Tsipras said. “Fifty percent of German debt was written off at the time. 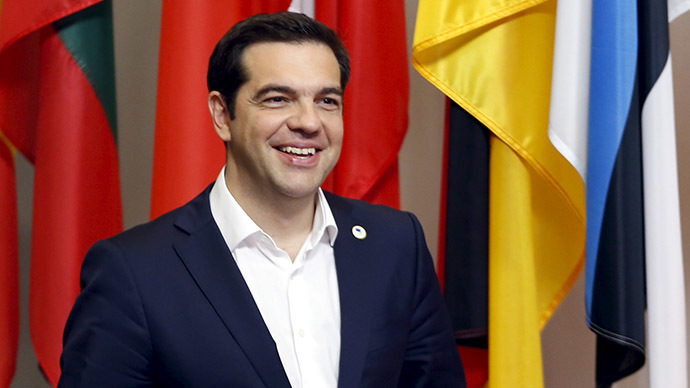 And that was the biggest extension of solidarity in modern European history,” Tsipras added. The London Agreement on German External Debts of 1953 covering money owed before and after WWII, reduced West German debt by 50 percent and stretched the repayment out over 30 years. This enabled Western Germany to quickly recover after the defeat and reemerge as a world economic power. Reducing German debt in 1953 was made possible with the help from Washington that poured over $13 billion at the time ( $150bn today) into rebuilding Europe and, as a long term trade-off, received a loyal and reliable trading partner that served as a bulwark against the USSR. Germany received $1.4bn of that money while Greece that suffered under German occupation got four times less. More than half a century later the world’s economic landscape has somewhat changed, but Greece apparently hopes that the 1953 scenario could be applied to keep Greece in the eurozone.